Hi Bill, Thanks for the tip. I was just wondering why launching options brings up the uac prompt. Seems a bit unnecessary. If you're talking about the launching of WinPatrol.exe requiring UAC you're correct, that isn't necessary and it not a requirement of WinPatrol.exe and never had been. If that has changed it's a complete mystery to me at this time. If you're talking about WinPatrol Explorer requiring UAC that's required and always has been. If WinPatrol is launching a 3rd party program like it does in Delayed Start then it's up to the program if it requires UAC. Sorry, didn't realize this was so widespread. Thought maybe you were sick or something. Glad to know you're ok and just busy. I finally backtracked and installed a version from last Sept. (25....something) and it so far has seemed to work. When I first installed it, I also d/l the enterprise version, so will probably install that tonight. Knowing you and your work, I didn't think the problem started with you. FYI this is the error message. I am a paid user and love this program. I'm having the crash problem. Tried to install Enterprise but won't install. Running Windows 8 Pro 64 bit & getting message that the Enterprise app won't run on my system. In my case, the "WP Alert" popped up after I applied a trivial update to ASC (Advanced System Care), and ASC then tried to update/install a BHO on IE. WP crashed whether I took a Yes or No for the BHO installation, with a Windows warning that WP had stopped responding, and Windows would close WP. After reboots, the same WP Alerts are still appearing, presumably because ASC had still not succeeded in installing that BHO. However, after replying Yes or No to WP, WP is just disappearing, with no warning dialogs from Windows. Using a very basic Win7-64bit. I have encountered the identical situation described above. In addition, my laptop monitor driver was affected somehow as I suddenly couldn't adjust the screen brightness. It was stuck in the lowest dimmed position. Had to delete and reinstall. Thanks for the quick reaction and temporary solution. I, too, have the same problem, solved by installation of the Enterprise edition. Win 7 64, with recent updates of a windows "platform update," Java 8 build 78, and Flash 11.6.602.175. Temporarily unchecking the cloud works for me. It's great to have Scotty back! I hated that he chewed through his leash and ran away all the time. I was just getting ready to send you an email about it. I do not have Java installed. I was having the same problem right after doing a Windows update. (Win7 64bit) Turning off the cloud fixed it. Thanks for a great program and your fast response to issues. Thanks Bill for the tip about unchecking the "Share" option. 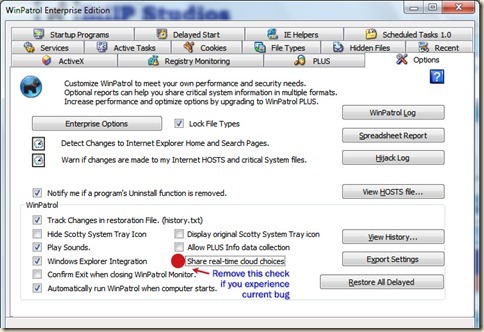 But you have to be quick - you have to get in and change the option before Scotty notices and reports the Java IE helper update! I installed Turbo Tax 2012 on Win 8 64 Bit. Winpatrol warned me that Inuit Update Service is newly installed. I say no, then Winpatrol crashes. I am a WinPatrol Plus customer. in case it helps you isolating the issue - since that windows update, apart of experiencing the WinPatrol crash, the 'Resource Monitor' window is empty for me, i.e from the task manager, 'Performance' tab, clicking on the resource monitor pushbutton does open the resource monitor but the content in it is void, transparent. Thanks for the tip! I was having this problem too. Looking forward to the next version. Thank you Bill for this and for your excellent software. Seems to have started after Windows 7 updates. IE10 and WLAN Dlink. Remove updates and tried reinstalling Winpatrol. Problem still there. Problem for me seem to start after IE10 and WLAN D-Link updates. Did a system restore and reinstalled Winpatrol. Problem continues. Nothing else updated in that time frame, except my daily definitions from Avast. Long time satisfied paid customer. Uncheckin seems to have fixed my prob Bill. Xp and Win7 boxes. My WinPatrol was crashing when a Java or AVast box came up. I haven't run Windows Update recently (set to manual). Dunno if that helps your investigations. Un checking “Share real-time cloud choices” did the trick. Now Scotty stands affirmatively. Soluto is crashing Winpatrol+ each time it boots up. 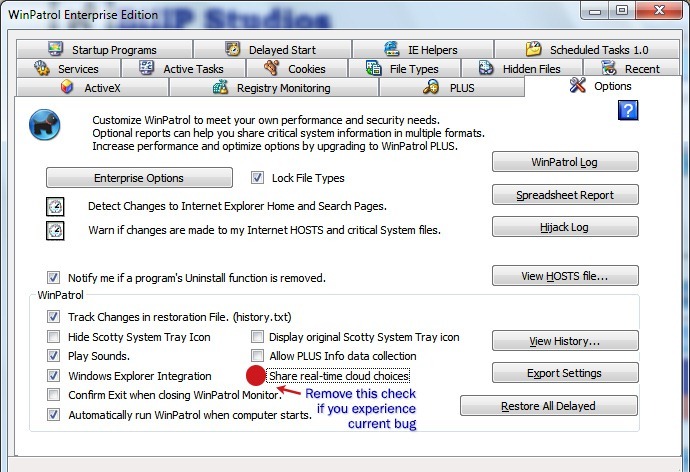 The init.exe belonging to Soluto is always detected by Winpatrol+ at boot up, when I click yes or no, it will still crash. Thanks Bill, Enterprise did the trick! Too bad I couldn't get WinPatrol to stay open long enough to read your fix before I sent my crashed puppy mail. Sounds typical. Uncheck the box above and things should be fine. Harry, Did you try unchecking the box I mentioned? Thanks Bill, yes I have had this problem with my IBM ThinkPad XT machine. However, I have also had issues (still unresolved) with my Kaspersky Internet Security stopping dead in its tracks while doing a Rootkit Scan after every time I reboot the machine. It was initially getting stuck on an Adobe Photoshop Album file 'pdfcreation.dll' but then after I deleted that file it is now getting stuck on the IBM Updater file 'java'dll. Kappy support have not yet been able to help me! OUCH! after 4 days of mucking around with it all. It 'seems' to have started soon after I took the latest update for my Adobe Flash Player. I would love to know how, who and when this will get sorted out. I have run out of ideas. Bill - firstly, WInPatrol is such a brilliant product and we love Scotty! Regards the recent crashing, it may be coincidence but I noticed the problem started on my PC just after I installed Google drive...? just installed oracle jave update 7 15 and prompt came up to add auto update then WP crashed. Reinstall Java without auto update and WP crashed. Thanks. This was a bit frustrating. It did spur me to upgrade to the newest version as I was still on one from last year. Unchecking the post to cloud seems to have fixed the problem for now. Looking forward to the next release so I can turn that option back on. Windows XP-SP3-Winpatrol Plus version.I have the same problem and it has been associated with Bitdefender "bdagent". Also, a few nights ago I installed the latest Java, followed by the latest Winpatrol. Scotty kept dying and I decided to reboot. That didn't go very well. Blue screen on reboot with a very common error code. I tried "Last Known Good", shutting down all startup programs and unnecessary drivers....blue screen. Tried to do a Windows repair and it would not let me past the blue screen. To make a longer story shorter, I formatted and re-installed Windows I have not re-installed Java or Winpatrol on this PC as it isn't really necessary. I am a lifelong software developer myself, and I give you the highest accolades for your efforts in running down this bug. No one knows better than I what a nightmare it can sometimes be to find something like this. Your in getting a temporary fix out to people fast is A-1 all the way. Your are my kind of guy, and thanks again. Hello Bill - This was happening to me on Win XP Pro after a new program was installed(HMA Pro VPN). I considered it a mild annoyance & wouldn't even have realized a fix was available if I had not checked for an update. Your fix of unchecking 'cloud services' worked like a charm. Very nice work and Thank You! Win8pro upgrade here never ever had Java. Just ran malwarebytes mbar root kit search.. during its search winpatrol popped a message wanting approval for mbar runOnce cleanup. Froze as soon as I pressed OK or whatever approval button. I unchecked the cloud option and will see if that works. update: so far so good as it didn't crash this time. Mine started crashing after I installed the new AT&T Tool software. Never had a problem before that. Had to uninstall AT&T and manually remove a bunch of associated files from the registry, but it did stop crashing. It's been a rough couple days but I always say, "It doesn't matter what they say as long as they're talking about you. I've worked hard to reply to everyone who sent Email. Everyone has been patient and many of you offered screen shots and detailed information to help me debug the cause. I'm pleased to say I have narrowed down the cause I'm anxious to release a new build. i'm sure there are folks who haven't heard about the fix won't have the normal WinPatrol experience. The new build is done but any release requires preparation beyond testing so I hope a new version will be available tomorrow. It won't crash and will include at least one new feature that you've all be asking for. WinPatrol crashed on me after the dreaded Google Toolbar tried to update itself (despite being disabled) and I clicked on 'No'. That add-on is *this* close to being nagware. Anyway, thanks for the update and support. Bug appeared after Java 7u15 and disapperead again after kicking it. Thanks for the heads up, disabling the cloud-share option works for me. 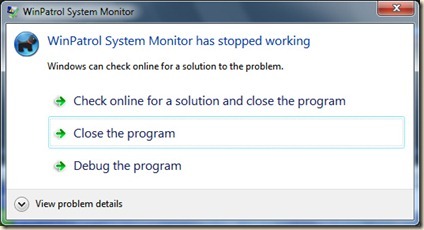 For me the crash happened after installing an update to my PDF-print driver which requested a 'run-once' action for the start up queue on Win7-64. On another note: might the sound issue you mention in the blog post have something to do with the recent NVidia audio driver update ? Hope this helps & keep up the good work! Same as most of the other posters. I updated System Explorer and WinPatrol didn't like it and crashed when I tried to click on the YES button. I have since removed it entirely, but will try again with the enterprise version. I have problems with XP and scotty dying but removing cloud stopped him doing this. So check if you have updated quicktime to 7 and try removing this. I unchecked: Share real-time cloud choices and now it doesnt crash for me anymore. WinPatrol not only started crashing, it also disappeared from the taskbar! I was about to uninstall and reinstall WinPatrol when I read others were having the same problems and a new WinPatrol version existed. Thank you. However, I do have an ongoing problem. WinPatrol alerts me after it has allowed a program and if I do not wish to allow it and click 'No' WinPatrol continues the alert until I click 'Yes'. It does this for every alert! Mine started crashinging last week when my Widdcom bluetooth software(from Broadcom Corporation) started. Winpatrol asked if it was ok to allow the pop-up stating a new startup for widcomm was starting, I clicked ok then winpatrol closed or crashed. With the latest update of yours Ver. 26.1.2013, it has not crashed or asked about the widcomm starting up. On my computer at home (XP Home SP3), I didn't get this problem after updating to the latest Java and Flash. I did get this problem right after updating my Anti-Virus program. Avast! Free AntiVirus, updated from 7.something to the new 8.something. The problem seemed to go away when I set WinPatrol.exe and WinPatrolEx.exe as trusted processes in Avast! Free AntiVirus. Could part of this problem be AV related? My gosh; I've been having numerous symptoms without knowing the cause... It also seems that it started right after Windows and Java updates. I've also had the laptop screen dimming and sound "disabled" messages. I've had problems with AnVir Task Manager, but that has been a little longer problem than this one, I think: do you know of any incompatibilities with that program? I've had numerous Firefox/ Windows Explorer crashes at about the same time as a WinPatrol message, too. I just now found your comment and I'm hoping it will solve some of the problems at least. I have a boatload of error messages and WER reports if you want, but it sounds like you've already figured out the problems. My gosh - I've been having numerous symptoms without knowing the cause! It also seems that it started right after Windows and Java updates. I've also had the laptop screen dimming and sound "disabled" messages. I've had problems with AnVir Task Manager, but that has been a little longer problem than this one, I think: do you know of any incompatibilities with that program? last year I had a similar prob . It happened not once but twice. the files win patrol and web root problems .first time Microsoft tried to update ie explorer from 8 to 9 or ? about 15 mounts a go my hinges broke found out fan did not run on high speed also winpatrol issues had web root confirm . I uninstalled updates as Microsoft instructed an they took control of laptop for a hour tried all (concluestion no update stay ie8 and vista blamed acer laptop ). In early 2012 their was another update where some how it got through to laptop (ie9)an my keyboard stop working so their tech (Microsoft )worked on it for 6 or more hours only keyboard I could use was on screen .I also had trouble with webroot same time and scottie did not install . (concluesion ) back to ie8 all ok said laptop ascer defect .well have or had 11 other ascer same or similar prob. The long winded issue just after last updates from Microsoft my hinge broke thought fan went bad but it was update again that caused fan to not go into high speed .I have been also having trouble with hp laptops from last update not reconizing wireless printers seems network /homegroup changed so printer not listed .The other issue on same hps is winpatrol does not load on startup have more info and corespondance I can send u ,.